Home | MODELS, KITS | T-REX REPLICAS | Giant Triceratops Head Dinosaur Wall Trophy 50"
Giant Triceratops Head Dinosaur Wall Trophy 50"
Giant Triceratops Dinosaur Wall Trophy. 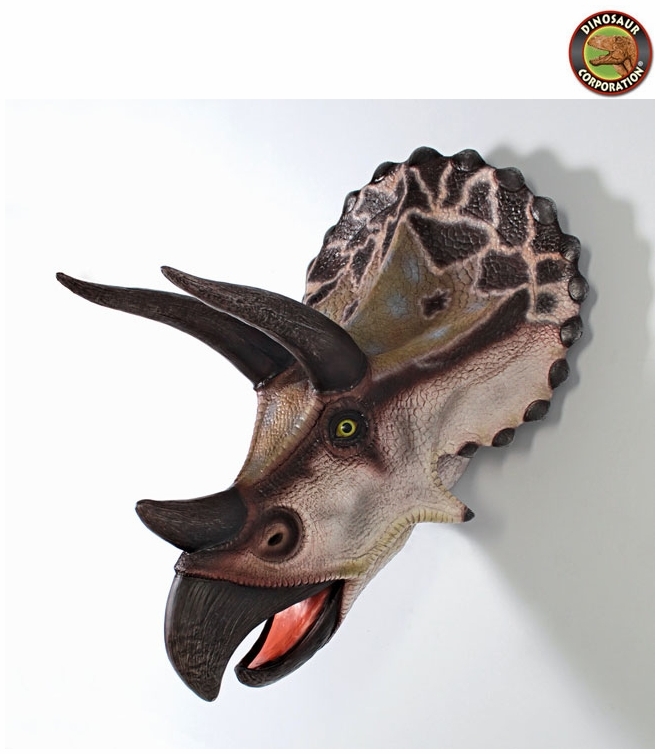 Our fierce Triceratops's head extends a full 42" from the wall in a prehistoric display of nature's artwork. Realistically sculpted with three horns and backward-pointing frill, used as defensive weapons against Late Cretaceous predators, Triceratops was well equipped to fight the Jurassic-sized T. Rex. Our giant, prehistoric replica dinosaur wall trophy is cast in quality designer resin, reinforced for supreme strength with fiberglass and hand-painted with powerfully convincing color and texture to be as faithful as possible to the form of its ancient species. Includes custom-designed, heavy duty mounting bracket to hold it securely on your wall. This product is in stock and will ship the same business day. How long will it take to be delivered? Click here to get estimated delivery date. I have a question about this product. Can I talk to a real person? Our experts are standing by to answer your questions 9 am to 5pm Pacific Time. You can email us or call us toll-free at 1-800-970-1128. ▪ Jumbo Tyrannosaurus Rex Skeleton Glow in The Dark Dinosaur 55"
▪ Scaled Tyrannosaurus Rex Dinosaur Wall Trophy 14"
We guarantee all our high quality products. If for any reason you are not 100% satisfied with your purchase, simply return the item for an exchange or refund within 30 days of purchase. Customer Support: 1-800-970-1128. Jumbo Tyrannosaurus Rex Skeleton Glow in The Dark Dinosaur 55"
Sign up now for specials deals and updates! The mission of Dinosaur Corporation is to support education and heighten the awareness of dinosaurs and other prehistoric animals. Dinosaur Corporation is a Federally Registered Trademark. All prehistoric world images and paintings are owned and copyrighted by Dinosaur Corporation. All rights reserved. � Copyright 2018 Dinosaur Corporation. All rights reserved.